It’s no secret that the Marine Corps will trim 20,000 Marines from its end strength by fall 2016, but Commandant Gen. Jim Amos has offered few details so far about how that will occur. Amos and other top Marine officials have been clear about how it won’t be done, of course. The Corps will not “break faith” with its Marines, they’ve said repeatedly, a catchphrase that represents their promise to not authorize reductions in force, which would result in existing contracts being broken. What about how it will be done, though? This week’s Marine Corps Times cover story addresses that, laying out the programs the Corps has at its disposal to trim the ranks. The squeeze will affect Marines of nearly all ranks, whether they’re first-term personnel seeking a new contract or a senior officers nearing the end of their career. As the cover image above suggests, the drawdown will likely be painful for some. The options available include paid early outs, forced retirements for officers and enlisted personnel and boatspace caps for Marines coming up on the end of their second enlistments. That’s life in the fast lane during a drawdown, even if its phased and deliberate. 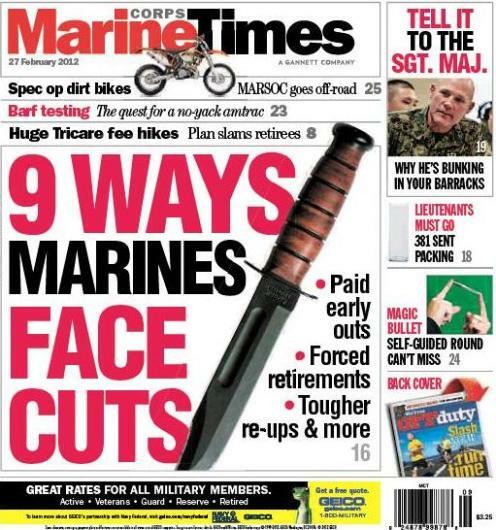 This week’s Marine Corps Times also includes an interview with Sgt. Maj. Mike Barrett, the Corps’ top enlisted Marine; a look at new dirtbike training at Marine Corps Forces Special Operations Command and a feature on the service’s earch for an amphibious tractor that won’t make Marines lose their lunch. HOLD ON Marines!! We get Obama out of there and get the economy back…you won’t have to worry about cuts. Ooh Rah. We are in the middle of one of the most dangerous times in history between Iran and other nations, and we are cutting down our military. That makes perfect sense. Well, Vinny, your President and CIC has been elected for another four years. I hope you’re one of the first to go with such disparaging remarks.